I have spent a lot of my life surrounded by nature. I like to backpack, bike, dive, and kayak in these natural environments. I also have the luck of having parents who are always planning to take me on another adventure where I get to see nature and its inhabitants in ways most people don’t get to enjoy. Through my backyard explorations, I have begun to realize that Port Orford has an amazing ecosystem in the coves and rivers that are very tied into our community. I’ve fished and swam in these rivers, gone on kayaking tours in these coves (with a great kayak company called South Coast Tours that we partner with), and I’ve seen the life that dwells in them. Growing up in a school of less than 100 kids I have learned to never reject an opportunity to be a part of something bigger and learn from that experience. 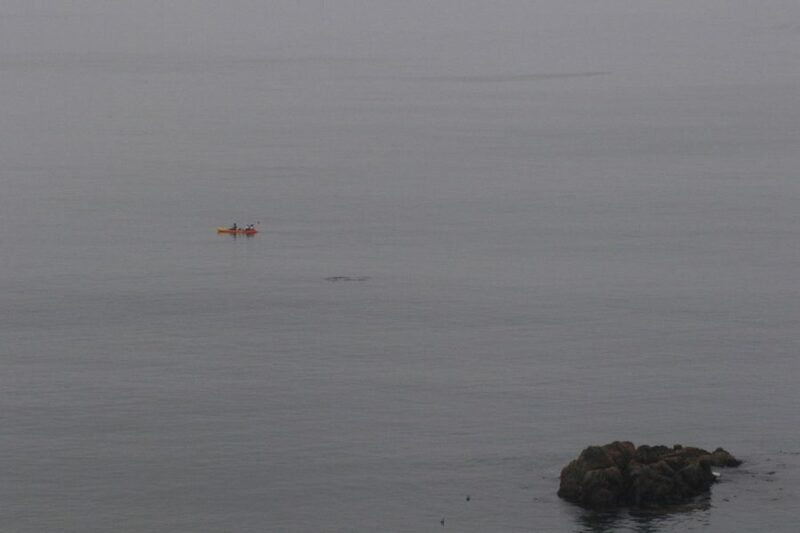 So when one of my close friends told me about an OSU project (a college I’m interested in attending) that needed interns to help collect data on gray whales, and kayak almost every day, I signed up without a doubt in my mind. The team gets some good practice tracking Buttons (Whale #3). Left to right; Quince, Nathan, Maggie, Florence. Fast forward a month, and I wake up at 5:20 am. I eat breakfast and get to the Port Orford Field Station. We make a plan for the operations of both the kayak team and cliff team. Today, I’m part of the cliff team, so I head up above the station to Fort Point. Florence and I set up the theodolite and computer at the lookout point and start taking half hour watch shifts searching the horizon for the spout of a gray whale. Sometimes you see one right away, but other times it feels like the whales are actively hiding from you. These are the times I wish Maggie was here with her endless supply of Disney soundtracks to help pass the hours. Imitating a ship’s captain, Quince points toward our whale while shouting “Mark”. A whale spouts out at Mill Rocks and starts heading across to the jetty. Hurray, its data collection time! 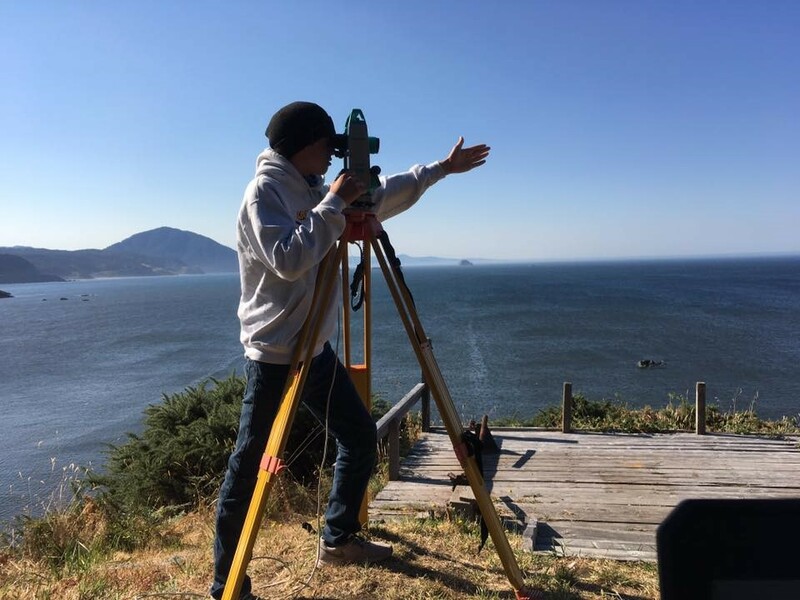 I try to quickly move the cross-hairs of the theodolite onto the position of the whale using a set of knobs like those on an etch-a-sketch. As you may understand, it’s not an easy task at first but I manage to do it because I’ve been practicing for three weeks. I say “Mark!” cueing Florence to click a button in the program Pythagoras on the computer to record the whale’s position. The left hand side of Buttons – notice the scatter of white markings on the upper back. Meanwhile, Florence sees that the whale has two white spots where the fluke meets the knuckles. Those are identifying marks of the beloved whale, Buttons. This whale has been seen here since 2016 and is a fan favorite for our on-going research program. Florence gets just as excited every time and texts her eagerly awaiting interns of previous years all about the sighting. 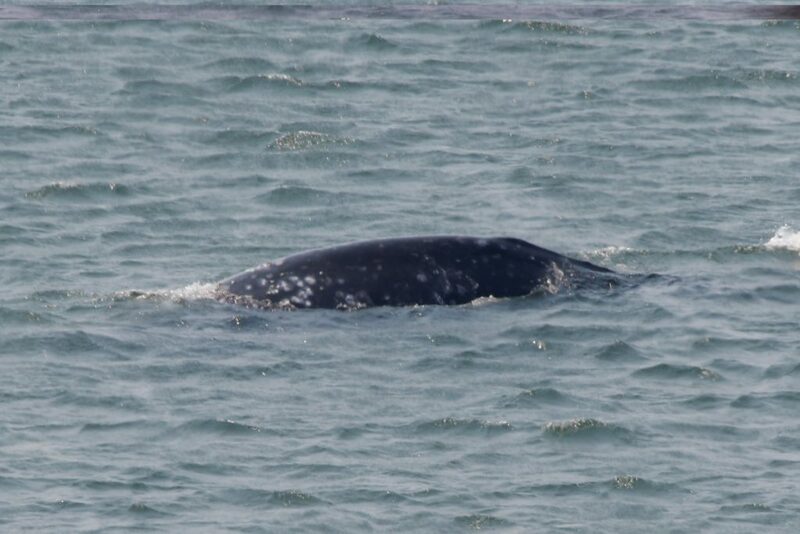 Of course Buttons is not the only whale to have identifying marks such as scars and pigmentation marks. This is why we make sure to get photos of the whales we spot, allowing us to do photo-ID analysis on them through comparison to our database of pictures from previous years. 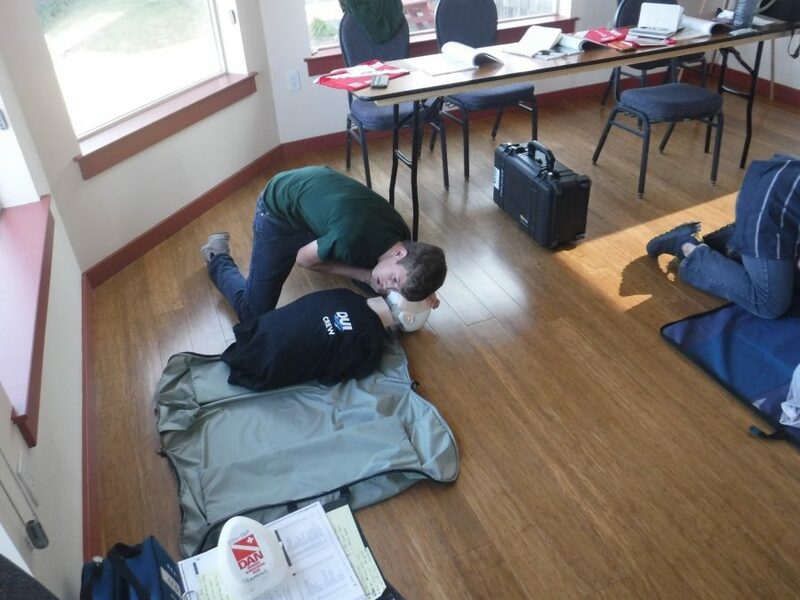 Quince practices CPR protocol on a training mannequin on his first day. So far I have gained skill after skill in this internship. 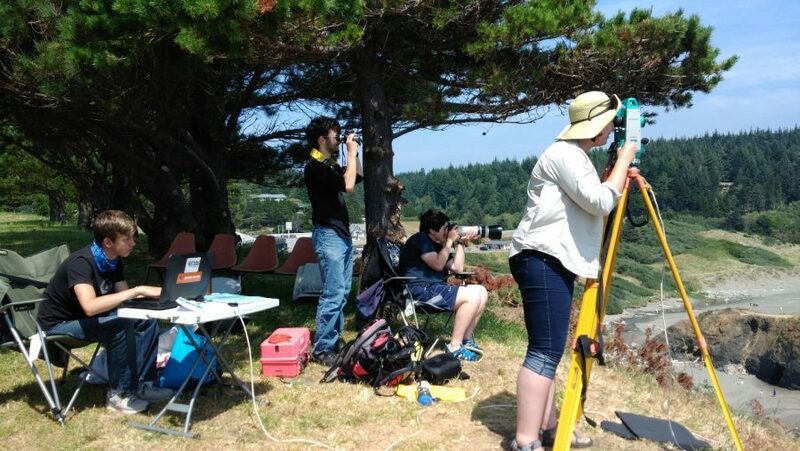 I got CPR certified, took a kayak training class, learned how to use a theodolite, and have spent many educational (and frustrating) hours entering data in Excel. I joined the program because I was interested in all of these things. It surprised me that I was developing a relationship with the whales I’m researching. By the end of August I’m now sure that I will also know many of the whales by name. I will probably be much better at using an etch-a-sketch, and I will have had my first taste at what being a scientist is like. What I strive for, however, is to have the same look in my eyes that appears in Florence’s whenever a familiar whale decides to browse our kelp beds. Previous Previous post: Curiosity and Community, new ways of exploring our environment.